Years of conflict in Yemen has resulted in rampant shortages of food, medicine and basic supplies, leaving millions of people on the brink of starvation. A United Nations-managed humanitarian emergency fund has allocated $70 million to strife-ridden Yemen, enabling critical life-saving relief operations across large parts of the country. “Through this new allocation, [humanitarians] will respond to the immediate causes of food insecurity and malnutrition; improve access to food, nutrition, health, water and sanitation services; and continue to support the ongoing cholera response,” said Jamie McGoldrick, the Humanitarian Coordinator in Yemen, in a news release issued by the UN Office for Coordination of Humanitarian Affairs (OCHA). “It will also provide a minimum package of assistance including shelter, non-food items and protection services to the most vulnerable individuals among internally displaced persons, returnees and host communities,” he added. Approved Wednesday, the latest allocation by the OCHA-managed Yemen Humanitarian Fund has prioritized 95 districts across 15 of the country’s 22 governorates, including Aden, Al Bayda Al Dhale’e, Hadramaut, Hajjah, Lahj, Sa’ada Shabwah and Taiz. It will also assist national non-governmental organizations which will implement more than 40 per cent of the total grant through some 33 projects run by 26 national relief actors (amounting to about $31.3 million). Even before the eruption of violence in 2015, Yemen had been suffering chronic poverty and under development. However, close to three years of relentless conflict has left more than three-fourths of Yemenis in need of some kind of humanitarian assistance to meet their basic needs and over 17.8 million people food insecure – 8.4 million among them severely food insecure and at risk of starvation. The latest, much-needed allocation – made possible through contributions from 18 donors – will help many, but more resources are urgently needed to ensure that the $1 billion funding gap in the 2017 Yemen Humanitarian Response Plan can be closed and all those who need assistance can be reached. “Basic social services in Yemen have virtually collapsed, therefore the continued provision of humanitarian assistance remains a lifeline for millions of people who continue to struggle in a crisis that does not make many headlines,” Mr. McGoldrick added. 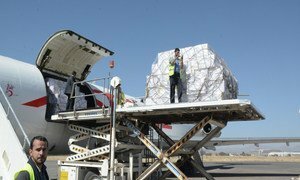 The United Nations food relief agency said Tuesday that humanitarian air service into Yemen has resumed, and a ship waiting in international waters for three weeks has now docked in Saleef, stressing that unhindered access to all airports and ports is vital to end the dire situation in the conflict-ravaged southern Arabian country.